I had actually tried to watch Nashville several years ago – I found the opening act to be far too chaotic to embrace, and shelved it for years. My renewed appreciation for Altman has prompted me to give this another go, and while I certainly like the film more than I had initially let on, I have to say it’s still doesn’t work nearly as well as Altman’s other films, and stands so far as his most disappointing (though still good) effort. The film functions as a commemoration of country music while analyzing southern mentality. It’s fairly effective at this, which prompts the question – why didn’t I love it? The problem may stem from the rather under-written nature of its situations and characters. Screenwriter Joan Tewkesbury has so many characters for us to follow, allowing so few of them to actually resonate. There are a few recognizable faces here and there, but their sense of aimlessness within the narrative framework begins to become aggravate, particularly given the long runtime. What I appreciate about Nashville, however, are the Altman-esque production qualities. In particular, the sound design is typical Altman – various people speak and step over each other’s words, therein demanding attention. Certain performances were especially noteworthy - Ronee Blakley as a waitress who is misinformed about her singing ability has an achingly sad effect. 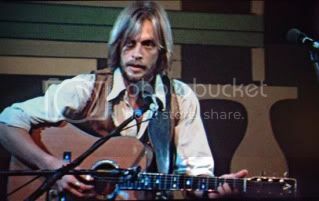 Keith Carradine’s role is noteworthy, less in the sense that his character is fully dimensional (which it wasn’t) but moreso for the music that Carradine wrote for his character – it serves to summate the emotional tone of the entire film. My own personal prejudice may hinder my reading for the film –I simply don’t care for country music. But despite that, I’ve done my best to analyze the film objectively – both as a critique of southern mores as well as another film in Altman’s oeuvre.